A dip into your pocket! ORLANDO is famed for Frak!, his cutesy Beeb game which was ever so badly ported to the C64 by Statesoft. His is also the name behind a number of quite brilliant Acornsoft titles. Now Orlando has discovered the Amiga, and has ported his 3D Pool game from the Archimedes and ST. This is a pool game like no other. It aims to simulate the game from the position of a player. The big O says this is the reason you cannot see the table from directly overhead. Even if you stood on the table - before the manager kicked you out - you would not get a proper overhead view. You would see your feet and the light would get in the way. So what you get is what you see - a player's eye view of the table. Except there is no cue. The white ball is fired along the player's line of sight with top-spin and bottom-spin relying on the viewing angle. Side-spin is selected from an icon at the top of the screen. Although you move around the table, the lack of a floor sometimes makes it feel as though you are staying still and throwing the table around. The mouse mechanism takes some getting used to. Since both 3D Pool and Virus started their respective lives on the Archimedes, it might be something to do with Acorn programmers being able to cope with sensitive mice. Pool is a short game, which makes it more exciting than snooker. 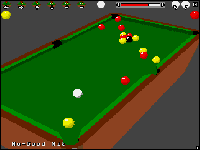 Even so, 3D Pool heightens the competition by providing a number of computer-generated opponents who play at different strengths. You can either practice against an individual or take part in a tournament in which the players are drawn at random. The final is played against Maltese Joe Barbera. Once you have proved you are the hottest cueman to have laid hands on a mouse you can have a go at the trick shots. These display numbers for the angles involved and have you trying to puzzle over how to get balls into the right pockets. After you have solved the 19 tricks you can set up your own using an editor. From the initial title screen - which was digitised using SuperPic right here in the Amiga Computing office - to the roar of the crowds as you defeat Mr Joe, 3D Pool is great. It is playable, slick and technically brilliant. Fully Amigaised to use sound, a 256 PAL display and blitter routines, the result is better than the ST. But then why else did you buy an Amiga? Ein wahrer Billard-Fan würde gerne das sprichwörtliche letzte Hemd für eine brauchbare Amiga-Umsetzung seines Lieblingssports hergeben - bis heute sah es in dieser Richtung jedoch zappenduster aus. Jetzt heißt runter mit den Klamotten: Firebirds "3D Pool" ist ein echter Leckerbissen für alle Queue-Schwinger! An Versuchen, das beliebte Spiel um Kugeln und Geschick auf allerlei Rechner anzusetzen, hat es nie gemangelt, nur hat es bislang kein Softwarehaus geschafft, einen Hit "einzulochen". Bisher scheiterten sämtliche Anläufe schon an der unrealistischen Perspektive: Kein Mensch hängt sich an den Kronleuchter, um den Tisch von oben zu betrachten. Genau aus dieser Warte aber präsentierte uns der Monitor im allgemeinen das Tableau. "3D Pool" jedoch hält, was der Name verspricht: Der Spieler darf nach Herzenslust um den plastischen Tisch herumlaufen und falls nötig, die Nase auch mal ganz nahe an die Kugeln halten (Zoomfunktion). So viel Realitätsnähe dieses System auch bringt, zunächst gilt es, sich ein wenig einzuarbeiten. Erschwert wird die Eingewöhnung noch zusätzlich durch den Umstand, daß der Spieler ohne Queue auskommen muß - zum korrekten Stoß genügt es, wenn der zu spielende Ball mit der weißen Stoßkugel auf einer senkrechten Achse lieft. Was sich hier in der Theorie schrecklich kompliziert anhört, ist (wie so oft) in der Praxis um vieles einfacher: Nach ein paar Trainingsrunden geht alles wie geschmiert, und der Anfangsstreß ist langst vergessen! Zudem bietet das Programm allerlei Funktionen, die dem Ballkünstler sämtliche Möglichkeiten eines "richtigen" Poolspiels einräumen. Sei es nun Effait, über - oder unterschrittene Bälle oder gar ein schwungvoller Gewaltstoß: mit etwas Übung gelingt vom Stop bis zum Vorbandstoß einfach alles. Da ist es auch nicht weiter verwunderlich, daß die Programmierer neben den üblichen Turnier- und Zweiband-Modi noch einige vorgefertigte Aufstellungen dazu gepackt haben, an denen der angehende Profi sein Talent für Trickstöße demonstrieren kann. 3D-Pool ist absolut konkurrenzlos. 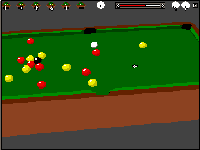 Die erste echte Billiard-Simulation! Pool is one of those distinctly unathletic games that people play in pubs - perhaps that's why the ZZAP! team like it so much! Remember the 64 version of 3D Pool? It was reviewed in Issue 52, getting a respectable 74%. The method of shot selection in the 16-bit version is largely unchanged; you have no cue - instead you rotate the table to aim your shot. The one alteration is that here the mouse is used to select icons to rotate, tilt, and zoom into/out of the table and to select shot power an spin. Alternatively, these functions can be accessed by pressing either or both mouse buttons and a direction. 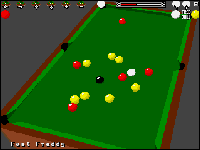 Play options include a tournament with eight computer opponents (including European pool champion 'Maltese' Joe Barbara), a two-player game, and trick shot play with its own shot editor. More detailed solid graphics allow the 3-D perspective to be more accurate than in the 64 version. Another improvement is that the computer players take less time to take their shots. Mouse control also speeds up play, allowing you to zip round the table faster than Alex Higgins! This is a playable, well-programmed pool sim - it is just like being down the pub (well almost!). While playing the real thing is best, this is a good sim that allows you to view the table from more angles than real life (unless you climb on tables!). As with real life, waiting for someone (i.e. Phil) who takes ages to line up their shot can be irritating, but that's part of the game. Fortunately, the computer players are quite fast, but not as much fun to play. In short if you are a pool fan get this, if not it's still very much worth a look. Ball 'clicks' and pathetic applause. The rules of pool are easy to understand. Eight opponents provide a lasting challenge.